I hiked. Boy did I hike. You might call it, in the end, a major trek to the highest volcano on Easter Island. And my guide today with hair down to his thighs was called Singa or Simba or the Lion King, as he introduced himself. He has a theatrical voice, is a surfer, and dances the Odi-Odi with the cultural musical group, Kari-Kari. He wraps his hair into a tight knot which he secures with grass blades, giving him a Maori look, although he is "mitad-mitad" or half Chilean and half Rapa Nui, as are most youth on this island. The morning route started in the north near Poike, the location of the 15 restored Moai, and ended at the Playa de Ovahe where waves bash against the rocks with fury. We set record time, I was told, in the two hour plus walk among lava rocks, horses rubbing their backsides on the sacred stones, and invasive thistles grabbing my pants leg. But this was my kind of hike. We stopped at the place called the Navel of the World, in other words the very center of earth - where a perfectly round stone marks the spot, and disrupts the arrows on anyone’s compass. The first settlers of Easter Island called it Te Pito o Te Henua (The Navel of the World.) Sadly, tourists have started chipping pieces out of this world’s naval. Photo: Sitting by the Navel of the Earth on Easter Island. Singa told me to sit on one of the four rocks placed around the center larger one. I chose the South. The smaller round stones seemed to represent the four directions. There one felt a certain power of being where one was, smack in the middle of everything and yet far away from just as much while the Pacific Ocean worked its tides nearby. I investigated petroglyphs of symbols of Rapa Nui’s history: turtles, tuna and bird man images carved into ancient volcanic rock on a terrain that was once treeless. With my trusty walking pole, sun block and Squaw Valley Writers cap, I was able to keep up with Singa, who talks and walks like a prideful lion on attack. He knows well the history of his island mixed into his skin and he clarifies the confusions one has. With so many stories and so many Moai, some standing proud, others fallen flat on their faces off the ahu intended for them at the sea’s edge. The ahu are platforms and crematoriums built on the beach bluffs of black volcanic rock where the ashes of royalty and important families were buried in volcanic ashes. He talked about the current degeneration of the land from too many useless horses and foreign fauna and trees taking up space where they should not. 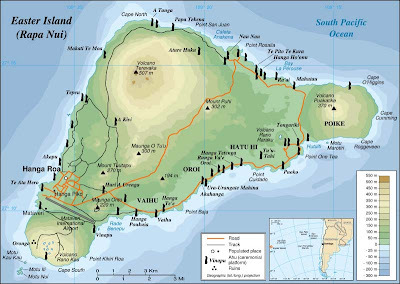 The indigenous plants were those brought by Hotu Matu’a, the first Ariki or king of the island: such as camote or sweet potatoes, guava trees, bananas, taro, papaya, calabaza, sugar cane and pineapples. These fight for air against the eucalyptus, ciebo and thistles poisoning the land. When many of the youth go off the island for education, they usually return to grab hold of what’s left of their history before it’s taken over by tourist power, beachfront millionaires or is misinterpreted by writers who think they have the answers. Most of the locals are horrified by journalists who visit for a pair of days only to report wild lies about the island: that aliens made Moai and put 600 of them here, or even more fantastic, that Moai are columns pushing apart the sea and the sky. It's all rubbish. Photo: The red topknot merges the feminine with the royal kings. Singa explained there have been three epochs in ancient Rapa-Nui history: the golden age of Rapa Nui when there was the building and moving of the Moai from the volcano quarry to the ahu’s; then the fall or collapse around 1500, when the war between the long ears (the wealthy kings) and the short ears (the workers) wiped out the good old days; ( this rebellion exploded because the king selfishly designated what kind of and how much fish the workers could catch, keeping the best for himself and hoarding as well all the feathers used in native dress). Finally there began the modern generation struggling to reclaim the land that Chile stuck a flag on in 1888 and still dominates. The Rapa Nui deal now with the mixing of races and the coming of the Christian missionaries that has produced the sensitive and beautiful people who are still rooted here today. The women are so "hermosa" they must have come right out of Solomon’s Songs and they dance a mixture of Tahitian and Hawaiian styles (feathers, leis, crowns, swinging hips and leg shaking) in the cultural show I was invited to see late last night. Finally, two female Moai has been found. Yea, for us. Whether there were many at one time or not is uncertain, but so far there have been two of them that are actual remnants of female Moai. The one in the Rapa Nui museum is amazing because of its similarities to the Cycladic women in Grecian art: the women having long heads and major bellybuttons. These female Moai were carved out of red larva rock and now I learned that the red stone top-knotches or pukao on the giant Moai statues are abstract representation of the female of the family. Since these giant stones are heavy and unruly, but simply hewn, they easily fall off the male Moai onto the ground and they are left there, looking like pillbox hats freed by the wind.. Whatever, call it Woman’s Spirit. Photo: The hardest climb to the Crater's rim. My most challenging adventure came in the southern corner of the island in the afternoon as I was convinced by Singa to attack the most difficult climb on this small triangular island - the Rano Kau crater which is 300 meters straight up through deep grasses and rocks and obsidian (black) stones which were originally used, along with white coral, for the eyes of the Moai. (There is only one statue on the island that actually has eyes. The rest have eye sockets that may or may not have once been filled with eyes.) There seems plenty of obsidian for restorers to make proper eyes. Remember the Moai are watchers for the people. As we ascended, I was bound to keep up with the fast moving guide, but I waned often. How many times on going straight uphill I thought I’d turn around and slide back down but one less than the times my mind said don’t be a quitter, get on with it. My untrained legs were straining as I had to lift them double high and the body complaining from the serviche I ate for lunch. The only reason I was still upright was because of my stick. But after two hours when we got to the top, we passed through a cypress grove (planted by outsiders) to reach the rim of the crater and then overlooked an emerald green caldera dotted with shiny pools of fresh water. We could see from the top the entire island, small as it is, and an endless ocean with only an occasional local fishing boat cruising the increasing winds. Clouds seem to be in layers, some hanging over the island as if held back by a net. Although the wind was gregarious as it whipped past us and I had to walk with a lean to the right so as not to be blown over the rim as we walked around it (about a mile), I didn’t give in (on the rim we trekked mostly on the flat, my forte) and finally we diverted off to the only place on this land where a fee is charged to enter a national historical site, the Tangata Manu, site of the ancient Birdman competition. This was one of the most important events on the island in ancient times, like the extreme Olympics of men braver than any competition in America, as they climbed down an atrocious cliff, swam in the rough Pacific Ocean on a self-m ade bellyboard of grass for two kilometers to an island where each candidate had to await for an albatross or frigate to settle there and lay an egg. He then grabs the egg, puts it in a special pouch so it does not break (if it broke, he’d kill the next man and take his) then returns as quickly as possible to his tribal leader with the winning booty. Even special quarters (see photo to right) were built out of volcanic rock (and have been restored) where the candidate, the coach, the head of his family tribe, and a virgin would live during the year after his victory and train for the next. The victor was so powerful, no one, not even the prize virgin, could touch him during the year of his reign. If he failed to win the next year, he had to return the unused virgin. As we stood on the top of the crater and looked outside it toward the three islands which were the candidates destination, the wind ruffled the water and kept us chilly as Singa continued to point out evidences of this famous competition. But by now, I was freezing from the bite of the wind, and my toes were numb. Luckily, a van was close-by to drive us down the backside of the crater where fresh squeezed mango and lemon juice awaited us at the Explora hotel. I guess that was my prize for finishing the hardest climb offered on the island.